Temperatures over 40°C and unseen dusty air for several days in a row. The unexpected weather conditions in Cyprus on 9 and 10 September were maybe not ideal, when President An Hermans and Secretary General Guido Dumon of the European Seniors’ Union (ESU) visited the country and the seniors’ association. However, this was easily compensated by the friendly welcome of Antonios Demetriades, ESU vice-president and president of the Cypriot seniors’ association, who invited them to Cyprus. On the first day, they started their visit with a meeting with the Cypriot Commissioner for Volunteers and NGO’s. 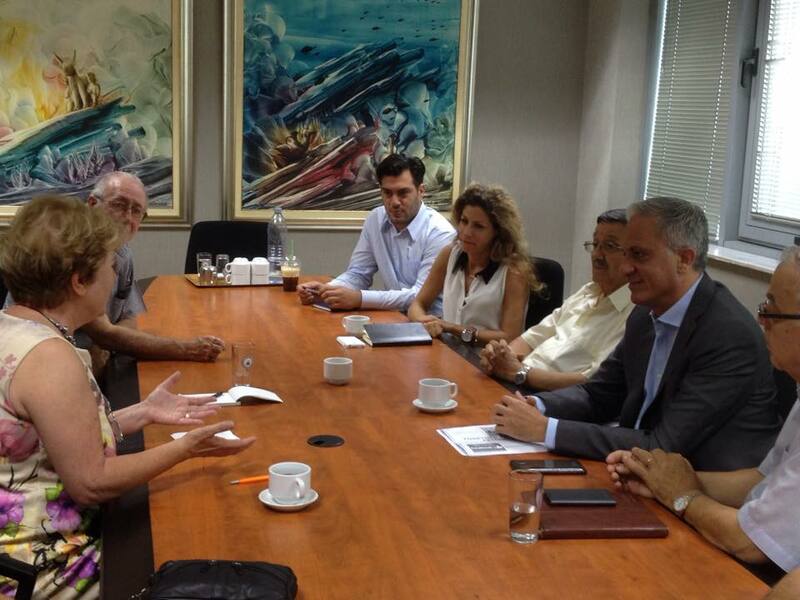 After that, they met the Senior Committee of Limassol. Plenty of interesting ideas were shared and exchanged. The Cyprus Seniors also expressed their hope for a unification of the island in the near future. On the second day, they continued their two-day stay with a meeting with the Minister of Labour, Welfare and Social Insurance, Zeta Milianidou, discussing the new policies on the minimum income and on institutional and home care. This was followed by an interesting meeting with the party leaders of Dimokratikós Sinagermós (DISY). The party leaders expressed their gratitude for the efforts and activities of their seniors’ association, conducted by Antonis Demetriades. In the evening, the president attended a celebration at the presidential palace in Nicosia, where 700 seniors gathered. The President of the Republic, Nikos Anastasiades, who was the founder of the seniors’ association in Cyprus, received the title of High Patron of the association. Antonis Demetriades, current president of the association, offered him this title on behalf of the seniors’ association. ESU President An Hermans thanked President Anastasiades for his commitment and expressed three wishes for the country. She shared the hope expressed by many seniors for more economic growth and employment and for a definitive solution to the Cyprus problem and the settlement process within the UN framework. To conclude, she wished that the president and the government would continue to support and appreciate the role of seniors in Cyprus and in Europe. After the celebration, all the 700 participants were invited for a drink in the garden of the presidential palace, which was the perfect closure of the two-day visit.